What is a ceynote and how are they formed? To explain ceynote diving Riviera Maya, we first have to understand what ceynotes are. Ceynotes also known as cenotes (Sey-Noh-Tays), are one of the most unique and wonderful marvels of nature. They are freshwater sinkholes in the jungle which are mostly underground flooded caves filled with beautiful, crystal clear, blue and turquoise waters that are perfect for swimming, snorkeling or ceynote diving. When ceynote diving in Playa del Carmen,and the Rivera Maya, you can see a wide variety of gorgeous and colorful coral reef and fish and when the sunlight manages to peek through the holes in the ceiling it can create a magical feeling. 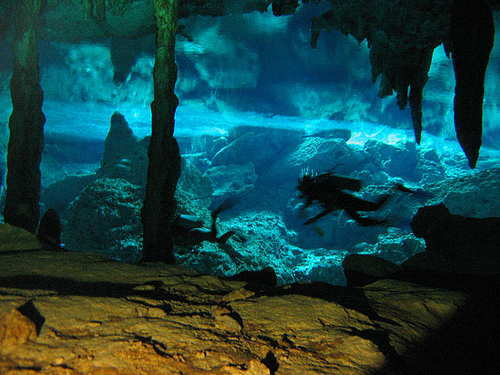 Millions of years ago the Yucatan Peninsula was once a coral reef which eventually rose up from under the sea. The result is a unique topography and soil composition which consists of a porous limestone shelf. 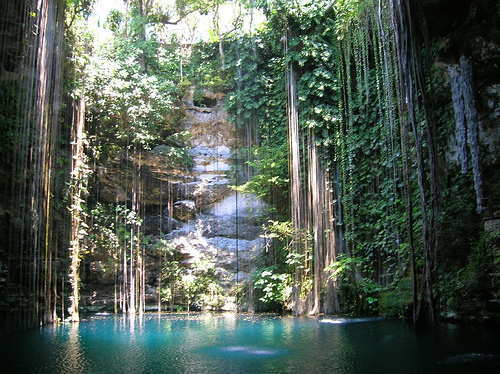 What this means is that the land cannot form an above ground river system and that the only freshwater source for the Yucatan is from the water that flows down from the highlands and collects in the underground cave systems of nonporous rock, where large deposits of water have gathered and pooled for over millions of years. The constant flow of water going out to the ocean over time erodes the cave’s ceiling which eventually leads to the roof’s collapse. 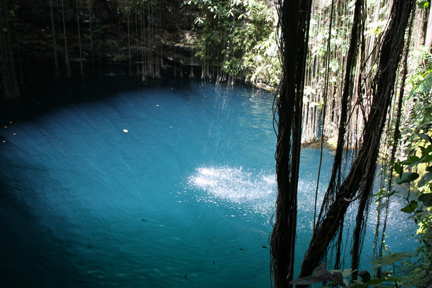 The hole left behind creates a sinkhole which is called a cenote. With the passage of time and erosion the sinkholes have become interlinked creating a network of underwater caves. The area around Tulum is a ceynote diver’s paradise as it is where the two longest underwater cave systems in the world intersect. The ancient Mayans considered these sinkholes or Dzenots, as they referred to them, as sacred holes since they were the Mayans only source of freshwater. They also treated them as their holy source of communication to the Underworld where their Gods dwelled. Most of the cenotes are not exposed to much sunlight and therefore retain a stable 75-78F degree temperature all day long, all year long. 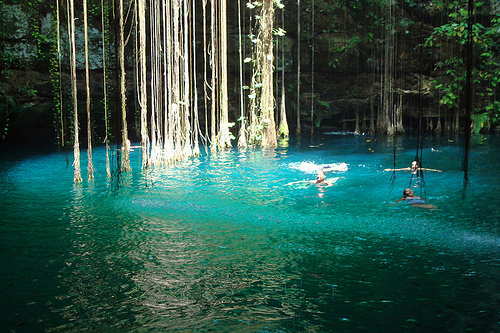 A really cool phenomenon happens when the cenote is close to the saltwater coast and the freshwater and saltwater meet. An alhoclyne or oily like layer occurs between the two waters which completely reduces your visibility through the layer. Since the layer is not too thick one can easily navigate above it or below it when diving. 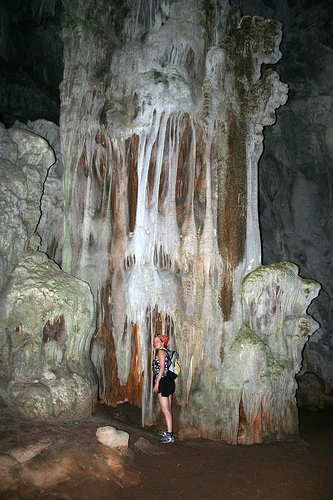 Another few odd and marvelous sites are the stalagmites and stalactites that populate the caves. Many years of varying water levels in the caves have left behind these interesting and almost art like formations of different sizes and thicknesses. The Mayans were not the only ones looking for a freshwater source. What an awesome sight it is to see the roots from the trees above pushing their way through the caves roofs, stretching great lengths down the holes, also in search of sacred freshwater. There are an estimated 3000 sinkholes in the Yucatan and there are four different types; completely underground, semi underground, land level like a pond, and an open well type. Stay tuned for more upcoming info on ceynote sites.